Tonight, Brazilian Mauricio "Shogun" Rua is up against American Chael Sonnen for the UFC Fight Night - august 17, 2013. The fight results and video replay highlights will be made available right after the fight. This fight is for the light heavyweight battle between former light heavy weight champ and former middleweight title contender Chael Sonnen at TD Garden in Boston, Massachusetts. FIGHT RESULTS UPDATE: Chael Sonnen defeated Mauricio "Shogun" Rua via Submission in round 1. 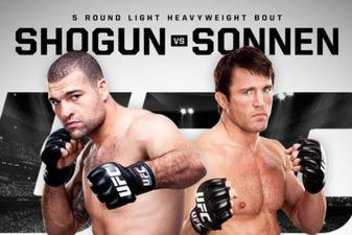 Will Chael Sonnen able to win against the Light heavyweight Champ Shogun Rua and be the contender in his new division? Thsi fight is in need to be seriously taken by both fighters. Whoever wins the fight will be staying the UFC company but the one who lost this match, Dana White will decide if he will not release the losser from the UFC. It's up to the UFC president. This is so critical that both fighter should win and a must win situation is in their both goals. Rua was not consistent with the fight results since 2009 while Chael Sonnen has still the spirit to gave the crowd more delight whenhe is fighting somebody. He won against the top middleweight contender Michael Bisping before losing to former middleweight champ Anderson Silva and current Lightheavyweight champ Jon Jones. Sonnen needs to come back his title contention by winning this fight against Rua. Rua has still the power and something to prove that he can fight with the tough fighters like Sonnen. Is he eventually be winning this fight against Sonnen? Let's find out. Will Sonnen be able to fight for the title crack with the current Lightheavweight Champ Jon Jones?